A spat over rent payments has caused Westlock to move a firetruck to a new garage, which the Clyde fire chief says puts rural areas at risk. Firefighters in a sprawling area north of Edmonton say a fight over where to store a critical piece of equipment could jeopardize public safety. On Dec. 23, 2014, officials with Westlock County removed a water tanker, known as a "tender," from the fire hall in the Village of Clyde. The village, an hour north of Edmonton, sits within the boundaries of the county but is a separate municipality. "My concern is the slower response times," said Clyde fire chief James Hoetmer. Hoetmer's crew of 10 firefighters protects the Village of Clyde and, through an agreement with Westlock County, rural areas just outside the community. While the village itself can still be served by its pumper truck, Hoetmer says the 11,000-litre tender is crucial to fight fires in rural areas. His crew will still have access to the truck, but will have to travel to a separate garage where the truck is stored, then proceed to the fire — a delay that could be as long as 30 minutes. He says the only other option is a pickup truck with a 300-gallon tank mounted on it. "But three-hundred gallons is hardly adequate for a doghouse, never mind a living establishment," Hoetmer said. 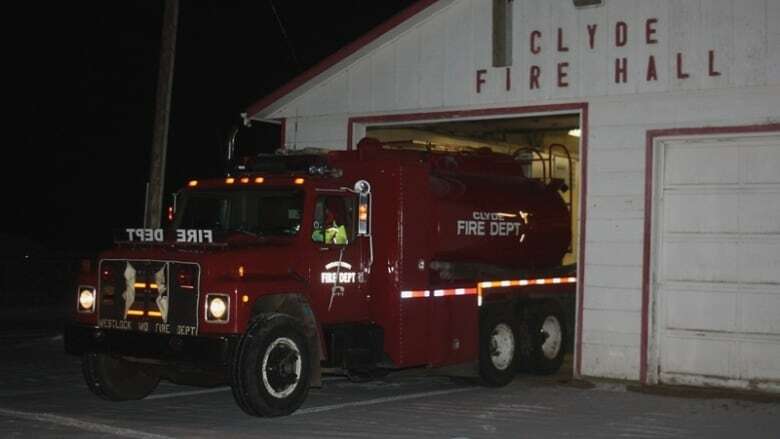 The decision to move the truck followed a request by the Village of Clyde for $3,500 a month in rent for storing the tender. The space had been provided rent-free since the early 1990s, but mayor Doug Nyal told CBC News the village now needs the money to help fund a new fire hall. "We shouldn't be the smaller municipality carrying the larger municipality and them getting the free ride. If anything, we need more help than what they do," said Nyal. He said the county had once provided the village with access to a landfill in exchange for use of the firehall, but that access expired years ago. Westlock County Reeve Bud Massey said the county has contributed its fair share to fire service in the Clyde area, including paying for utilities at the hall, insurance and firefighter training. Massey said taxpayers won't tolerate the extra money that the rent would cost. "Thirty-five-hundred dollars (a month) comes out to $42,000 a year. That is almost a 0.5% tax increase for our residents," Massey said. "We're a large land-mass and a small-budget municipality and we have to be careful how we spend our taxpayers' dollars." Massey said he has been assured by county officials that response times will not be affected by the relocation of the fire truck. While Nyal and Massey disagree on the issue of rent, they are both disappointed that relations between the village and county have turned sour in recent months. "It's been a good relationship," said Massey. "It's unfortunate that this request has put damage to it. And hopefully, we can sit down and change that." Hoetmer wants the decision-makers to put aside their differences for the sake of public safety. "It's come to the point when it's just a political thing of politicians unable to come to an agreement."